St Patricks Day brings about many celebrations across the world, and whether you’re a traditionalist or superstitiously sporting your all green attire, the chances are you’re gonna need a playlist to complement the day. Here we’ve compiled a list of our top 20 Irish songs that we believe are a must for your St Patricks Day party! The Cranberries – Again, how could we claim this as a St Patricks Day playlist without The Cranberries? Zombie & Linger have made it on to our must-have playlist. Flogging Molly – This band screams St Patrick’s Day, and they’re sweet Irish tunes are a definite must for our top 20 this year! 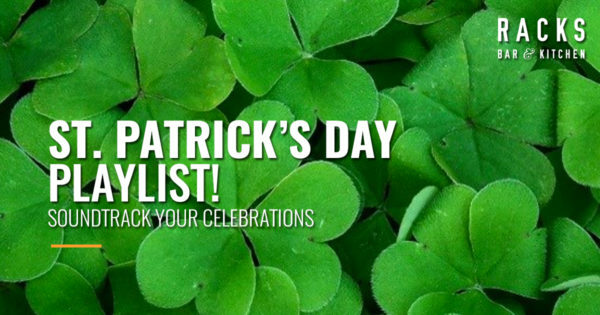 There’s a bit of everything and something for everyone in this list, to ensure you and your entourage enjoy the Paddy’s day celebrations. And if you’re sticking here in Bristol, pop on in to Racks Bar and Kitchen and enjoy some of our Irish themed booze, food and tunes! Full details here Check out our Spotify playlist to listen in on these awesome tracks.